This episode of Law & Order UK, “Unsafe” was based on the US Law & Order episode form season four titled “American Dream." Law & Order fans will recall this Ben Stone (Michael Moriarty) episode which guest starred the ever-creepy Zeljko Ivanek, who played the character that managed to appeal his murder conviction, wins, sues Ben Stone, and eventually Stone nails him for the murder of a witness. It was one of Law & Order’s best, and I have to say that the UK version keeps up that standard of excellence. Since the only actor I am very familiar with on the UK series is Jamie Bamber, I am looking at the rest of the cast with no previous opinions about any of them. I’d have to say that I think this cast has great chemistry, and I am beginning to really like Bradley Walsh, who plays the “Lennie equivalent” DS Ronnie Brooks. While there is no one who can ever match Lennie, Brooks does an excellent job and he and Bamber seem to play very well off each other. I also think Ben Daniels is excellent in his role, and I find him as passionate a prosecutor as Jack McCoy. I loved the scene where Steel throws down his box of papers and they scatter, and Steel gets in the face of his tormentor. You could feel Daniels’ anger coming right through. All in all, very well done, and I think that this episode would be well liked by US Law & Order fans if/when it gets aired here in the US. A man is walking the river bank with a metal detector. He finds something that shocks him. Later, we see DS Ronnie Brooks (Bradley Walsh) and DS Matt Devlin arrive on the scene. Apparently a male corpse had been found, face down, wrapped in the remnants of a sheet, very decomposed, only the skeleton remains. He was found with a Swiss watch – still ticking, which is what likely set of the detector. The body could have been there between 2 and 10 years. There is no ID, no teeth so a match to dental records isn’t possible, He was killed by a single gunshot wound to the back of the head, the bullet is still there. Brooks says it looks like an assassination. Back at their unit, they tell DI Natalie Chandler (Harriet Walter) that they are trying to identify the gun. They are also checking missing persons; there are 39 possible matches. The best lead is the watch, and Chandler sends them out to check the watchmakers. At Castiglione Watches, he tells them to check with the manufactures as they have a registry of the owners. At the manufacturers, there is nothing in their computer system so the paper files must be checked. They find the watch is registered to a David Ackroyd. Back at the squad, Chandler brings them some evidence they found in the leg from the body, it was a pin from his knee, and there is only one man from the missing person’s list that it would match – David Ackroyd. Ackroyd’s killer is already in prison, Luke Slade, who was tried and convicted by James Steel, even though the body could not be found at the time. Chandler tells them Ackroyd was survived by a daughter. Later, at the home of Louise Ackroyd (Charlie Covell), she says her mother died the previous year from cancer, and now she is alone in her parent’s house, and seems very dejected about the matter. James Steel sends her a card every year just to see how she is doing. She asks if her father’s body was where they said it would be – at a building site? They tell her the body was found across the water from Canary Wharf by the dump. She says this makes no sense. Back at the unit, they are concerned that Steel got a conviction but without the body, and now the body was not where it was originally expected. The whole case was based on this information from Richie Newman (Nicholas Beveny), and that he and Slade buried the body at a building site in Chelsea. According to Newman, he killed Ackroyd with a knife and the weapon was never found. Brooks says, “You pull one thread, and the whole thing becomes unraveled.” Chandler tells the to find Richie Newman. They later find Richie and bring him in to be interrogated. They ask him why Richie’s original information on the case doesn’t match. Richie seems shocked, and he said he wasn’t there when Slade killed him. He says if Slade gets out, he will be a dead man. Afterwards, they discuss the fact that Richie seems genuinely worried. Chandler approaches, and tells them that Luke Slade’s case has been referred back to the court for a potential miscarriage of justice and he could go free. At the Crown Prosecution Service, Brooks and Devlin bring over boxes of files on the case to James Steel (Ben Daniels). Later, Steel and Alesha Phillips (Freeman Agyeman) arrive at the courthouse, and are greeted on the steps by Luke Slade (Iain Glen). He tells them he is representing himself for his appeal, he had a lot of time on his hands so he studied the law. He asks Steel a question about Steel’s marriage, and Steel reminds him that this is a murder case, and he should have a barrister. Slade pulls out his watch, with handcuffs still on. 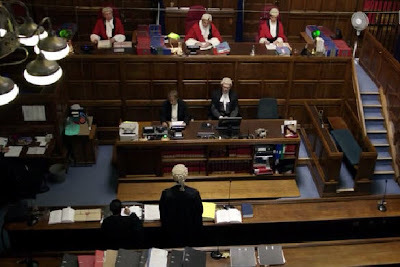 Inside the Royal Courts of Justice, Slade thanks the court and begins to make his argument about the discovery of Ackroyd’s body and cites precedent of convictions that were quashed when the Crown’s main witness gave false evidence. The method of death and manner of death is not consistent with original testimony. Phillips and Steel look on, concerned. Later, as Steel is in the office, he is watching Ackroyd’s daughter talking to the press, with Steel at her side, about the turn of events. Phillips enters and tells Steel he needs sleep. He tells her this was his first case with the CPS. He wonders if he was wrong. She tells him Slade is guilty and everyone who has read the file agrees. He reminds him he needs to rest, and he says soon. Back in court, Steel presented his own precedents, saying that Newman did not lie when he gave his original testimony. If this would render the conviction unsafe, it would reward Slade for lying to Newman. The crown argues that he corpse was murdered after the original burial as Slade was covering his tracks. But the judge says this is a theory, does he have evidence? When Steel says no, the judge says this is exactly what a retrial should explore. Slade seems to be gloating. Outside on the courthouse steps, Phillips approaches as Steel fiddles with a Rubix Cube. She tells him they agreed with Slade and his conviction has been overturned. As the reporters rush out with Slade, he tells them that David Ackroyd was like an older brother to him and he was heartbroken by his death. But the CPS made a mistake so David’s murderer is still free and he looks forward to proving his innocence. Steel gets up from the steps and Slade faces him and reaches out to shake Steel’s hands, saying he forgives him. But Steel refuses to shake his hand and walks off, much to the Slade’s satisfaction. Steel is at the grave of Ackroyd with Ackroyd's daughter Louise and apologizes for letting her down at the appeal. As she looks off, to her horror she sees Slade approaching the grave site. Steel asks him what he is doing there, and he says he is paying his respects. He says he wanted to tell Louis her father was great man and he wants to bring her father to justice, and he begins to move in closer. Steel steps up, and tells Slade to get away from her. Slade says too many people failed her and he won’t be one of them, and he will make things right, and as he leaves, Louise begins to cry. When Steel tries to console her, she tells him not to touch her. She angrily says he failed her and her father. Back at the detective’s unit, Steel tells them that he has to prove the case all over again. He wants all the evidence to look at it again, the detective team suggests to look again at forensics and track down all witnesses. Steel says does not want Louise Ackroyd to see her father’s killer go free. Slade and Ackroyd were investment capitalists, involved in the dot com boom, so Brooks and Devlin decide to look at that angle. At CZY Developments Ltd., they talk to Elena Adani (Amber Agar) who had a relationship with Slade. She said David’s thought Slade would all make them rich – they all thought that for a while. At forensics, they are told that it is all about the dirt. The particle of dirt on Ackroyd’s body matches the “pedagogical profile” – soil - of the Chelsea area. This seems to support Newman’s story, as the dirt from the wharf doesn’t match that soil. The girlfriend’s car shows some soil from two beaches, skin, and other things you may find in a mattress, and also fiber traces which match the sheet in which the body was found. This seems to support that Ackroyd was dug up and moved in Ackroyd’s girlfriend’s car. In the robing room, George Castle (Bill Paterson) gives Steel some advice, telling him not to let Slade rattle him, he got it right in the first trial, he’ll get it right again. Steel tells Castle if he continues to be nice to him, he won’t be able to concentrate at trial. But things get messy when Phillips rushes in and tells them that Richie Newman has disappeared, no one has seen him in three days and his last credit card charge shows a one way ticket to Thailand – and the trial starts in 13 minutes. Now at the trail Crown v Slade, Steel asks for more time because Newman can’t be located, but says he will have to make a motion to have Newman’s original testimony read back at the trial. But Slade won’t have it, as he said new evidence contradicts Newman’s original testimony, and how can he attack Newman’s credibility if he can’t cross examine him. The court denies Steel’s request for adjournment or to all him to use Newman’s prior testimony. Unless he can produce him, they won’t be hearing from Newman. Back at the unit, Steel speaks with Brooks and Chandler, but they have everyone on it. They suggest talking to Slade’s cellmate. At Ashbridge Prison, they speak to Slade’s cellmate Danny Doyle ( Michael Smiley) who said he has a problem with his memory, and asks them if they have cure for it, clearly trying to get something for his information. Back at trial, Slade’s girlfriend Elena Adani is on the stand, talking about how Slade used to like to mess people’s heads. She also found a diary of Slade’s and reads some of it back, which had a notation for 9:00 PM the day of the murder to “Kill David.” Slade cross examines her, and mentions that Elena seems to be upset about him breaking their relationship, and brings out messages she left with him which indicated she wanted him to suffer. On the stand, Slade’s cellmate Danny Doyle testifies that Slade said he moved the body. But Slade asks him about a previous case where Danny gave evidence in a court case in exchange for a transfer, but the evidence was false, and he was later convicted of perjury. Steel is unhappy as this ruins Danny’s credibility. Later, in Castle’s office, Castle is having a conniption. Castle says maybe if they find Slade innocent Castle should offer him Steel’s job. Phillips tells them both to stop, and they need to keep going, together. Back in court, Slade is on the stand, saying the last time he saw Ackroyd he was drunk, alive, and heading to Mexico for the holiday. Steel asks him about the note in his diary and if he made notes about killing anyone other than Ackroyd, and Slade says it was a joke. Steel asks him if he can explain the dirt and fibers from the sheet in his car, the same as what was found on his body. Slade says the sheets were mass produced and the soil is very common. Later, Steel summarizes, telling the jury to keep to the evidence I mind. But Slade counters that the evidence does not support it, and to let him live what is left of his life. The jury finds him not guilty, and Steel looks crushed. Ackroyd’s daughter Louise runs out of the courtroom. Outside sitting on a bench on the busy street at night, Steel bemoans the outcome with Castle, and Castle says he still supports him, whatever happens. When Steel ask him what that means, Castle tells him that Luke Slade has lodged a formal complaint against him saying Steel had a vendetta, his argument it amounts to gross misconduct. Slade wants him out of the CPS. Outside, Steel has his box of his office belongings and files, and Slade approaches, asking him if he needs a hand. He says he admires Steel that he won’t retract the complaint, and Steel storms away from him as Slade continues top needle him, saying he will look after Louise. Steel throws his box on the ground, scattering everything, and gets in Slade’s face, telling him if he goes near Louise again, he’ll come for him. Slade asks him if that is a threat, and that Steel has lost all sense of what is right, he’s an obsessive, and to let it go. Steel asks Slade what were Ackroyd’s last words and if Ackroyd begged for mercy or didn’t even know if it was Slade that shot him from behind. Slade said the city was built on corpses, why does this one matter so much? Steel growls that they all matter. Slade says he looked really mean there, how doe she live with that conscience? He says Steel is an obsessed, discredited man out on his own, while he is a rehabilitated man, out in society. Steel yells, “This isn’t finished!” and Slade asks him if he thinks his complaint won’t stick, he’s not a beginner. He says goodbye and walks off. Leaving Steel to pick up his mess of papers. Later at the pub, Phillips tells Steel he shouldn’t have talked to Slade, but Steel said he had no choice. Phillips said it doesn’t matter, he shouldn't be seen with him. Steel says this would not have happened had Newman not disappeared, and thinks Slade had something to do with it, saying Slade wouldn’t be stupid enough to do it himself. Steel thinks they should dig out Slade’s prison record, and see if anything comes up, asking for Phillips’ help. In the office, Phillips says Castle will “go mental” if Castle finds out she let Steel in. She finds Slade filed a complaint against a prison officer on behalf of another prisoner – Danny Doyle. Castle walks in, spots them, and says he’s still at the Royal Opera House and to switch the lights off when they leave, clearly indicating he doesn’t care Steel is there and that Phillips is helping him. Back at the prison, Steel talks to Danny and pressures him about his testimony. Danny admits he is a con, not known for telling the truth. Steel says he will continue to show up at every one of Danny’s parole hearings reminding them that Doyle helped a murderer go free. Danny asks Steel what he wants, and he wants to know where to find Richie Newman. He says Freddie Martins’ - Slade called in a favor. At McFarlane Lane, Brooks and Devlin approach a construction crew, and when one man won’t tell them where Freddie is, Devlin calls out Freddie’s name and Freddie looks up, and then begins to run, Devlin gives chase while Brooks leisurely follows. Brooks manages to block the route where Freddie was headed, turning him back onto a waiting Devlin. Devlin subdues and apprehends him and read him his rights. Later, in junkyard, they find Richie Newman’s body in the trunk of a car. When Slade is out for a run, Brooks and Devlin are waiting for him. Slade asks them if they are enjoying the day, and Devlin grins, saying they are about to. Later, Steel approaches the grave of David Ackroyd, and Louise is there tending to it. He hands Louise some flowers, and Steel begins to clear out the old flowers, as we fade to black. It wasn't a bad episode this one, the series is picking up a bit. 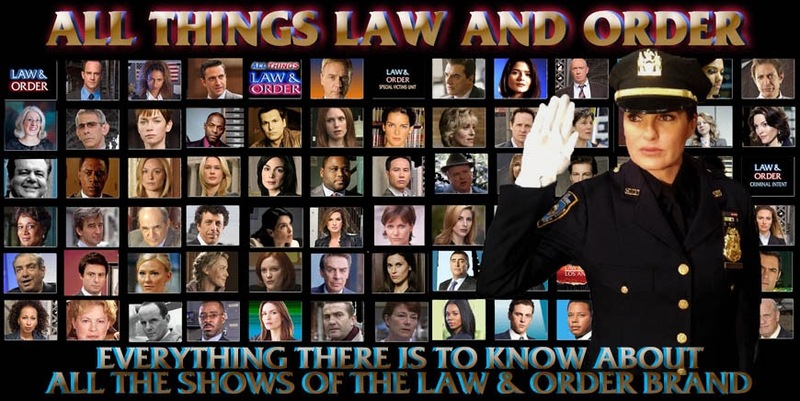 Do you know what episode of L&O USA this is based on allthingslawandorder? Hi Jane, I mentioned at the very beginning of the blog entry that the episode was based on the US Law & Order episode from season four titled “American Dream." Hope this helps!